Item #0001: Long-time authority on raw foods, superfoods and truly natural bodybuilding, Thor Bazler outlines numerous techniques and strategies on how to gain muscle and strength completely naturally, eating a diet of raw foods and superfoods. The author explains that every natural-living creature and organism on planet Earth is eating a raw-food diet--and so can you! A gorilla has the strength equivalent to bench-pressing 4,000 pounds. Where does he get this super-strength? What does he eat? Raw Power! provides unprecedented information on the link between diet and bodybuilding fitness. 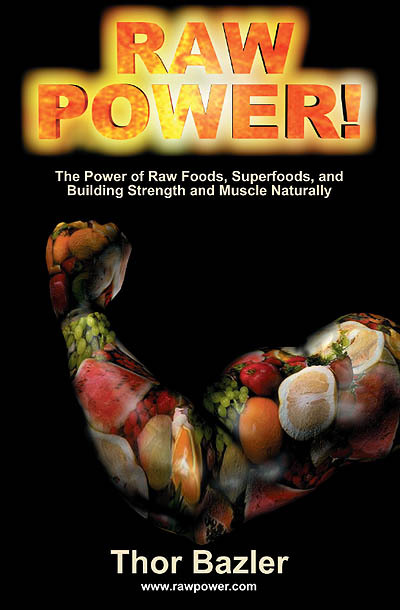 This highly informative book contains chapters on: a raw-food diet, protein, minerals, hydration, Thor's personal workouts, Thor's raw bodybuilding menu plan, Thor's smoothie recipes, and much more. Also included are comprehensive lists of the best raw bodybuilding foods, supplements and superfoods. Message from Thor: "My book Raw Power! was originally published in 1998 under my former name, Stephen Arlin, and has been out of print for several years. I was working on a new book (tentatively titled Raw Power 2), but instead decided to include all that new information in a completely re-written, up-to-date, Raw Power! book. This new Raw Power! 4th edition contains several new chapters and a lot of new material based on my experiences with raw foods, superfoods and strength training over the last 13 years." * Protein: How Much is Enough? * Which raw, vegan foods are most important for helping build strength and muscle? * What dietary advice do Bruce Lee, Sylvester Stallone and Jack LaLanne have in common, and how can a raw-food eater benefit from this? * Thor's list of the most nutrient-rich Superfoods, and how they can be implemented to help with building super strength and muscle. * How much water should you drink each day? * What amazing feat of strength and endurance did Thor witness to cause him to completely change his workouts? * Thor's personal, exact, detailed workouts (including poundages) for building super strength and endurance. * Thor's meal and exercise schedule showing a sample day of raw-food meals--including calorie, protein and fat counts. 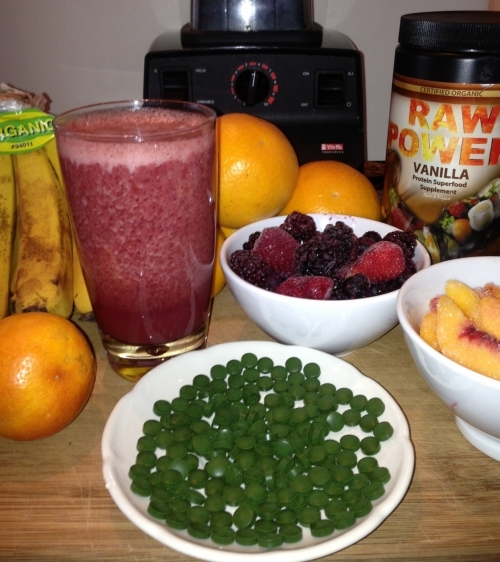 * When is the best time of day to drink a protein/superfood smoothie? When ordering, please let us know if you'd like your copy signed by Thor. To read reviews about Thor Bazler's Raw Power! book, please click here. Blend all ingredients until desired consistency. Then, depending on your tablet-swallowing capabilities, with each swig of your smoothie, take 3-15 Thor's Hammer tablets (item #0556). This super meal contains approximately 40 grams of protein and little to no fat, and has countless health benefits. Massive nutrition...truly one of the healthiest meals anyone is eating on Earth today!